The pawn is the piece with the smallest value on the board. But pay attention! Don't fall in the trap that many beginners tend to fall into, of thinking the pawn is not important. It is very important as you will see. 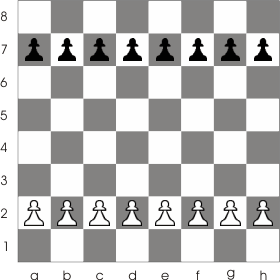 At the beginning of the game each side has eight pawns positioned as shown in the following diagram. The pawn can only move forward one square as long as the square in front of it is not occupied with another piece. 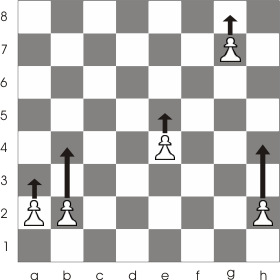 From the initial position the pawn can move two squares. 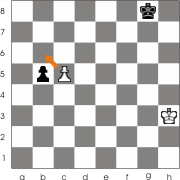 Look at the following image to see how the pawns can be moved. 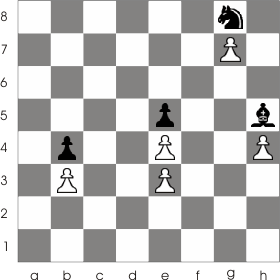 In the following game none of the pawns, black or white, can be moved because they are blocked by other pieces. A pawn can capture a piece that's one column on its left or right side and one row in front of it. That means that it can capture by going one square forward on the diagonal as shown in the image below. There are cases when a pawn can capture a piece but may choose not to do that. 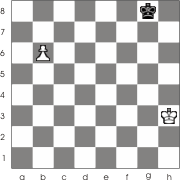 For example, in the image below, the white pawn from h2 can simply move forward at h3 or h4 without capturing the black rook. That would be a perfectly legal move. You can learn more about capturing pieces at learn to capture. There is another kind of capture a pawn can do. 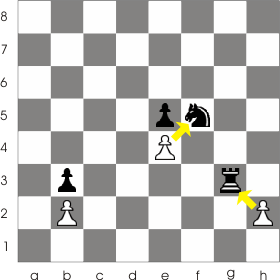 If a pawn has under control a square over which an enemy pawn jumps (when making its initial move) that pawn can capture the enemy pawn by moving on the square in front of the initial position of the enemy pawn. This is called en passant and is a french term which means "in passing". For a better understanding of this move take a look at this example. There is another thing you should know about the pawn. One of the things that makes it so important. If a pawn reaches the last line (1 for black pawns or 8 for white pawns) it can and must be replaced immediately with a piece of its own color except the king. This is called a promotion. 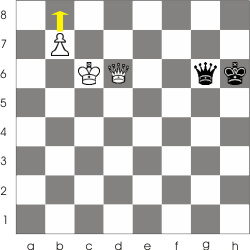 The pawn can be replaced with queen, rook, knight or bishop, even if those pieces are already on the board. So you could possibly end up with 2 queens 3 rooks and so on. 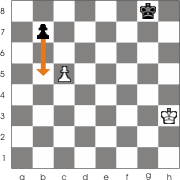 Usually the pawn which reaches the final line is transformed in a queen (this being the strongest piece on the chess board), but that is not always the case. Sometimes it pays off promoting another piece depending on the position. At the beginning of the article I mentioned that the pawn is very important. You can understand now why is that, by knowing that a pawn can be promoted. But that is not the only reason that makes this piece so important. The fact that this piece has the smallest value makes it so important. Sounds confusing? Well.. it's not, and I'll show you why. The fact that it has the smallest value means that the opponent can't change a piece having a bigger value with one of your pawns because that would lead to him losing the game. So the squares that are under the control of your pawns are the strongest for you. The blue squares are strong. They are under the control of the two pawns. 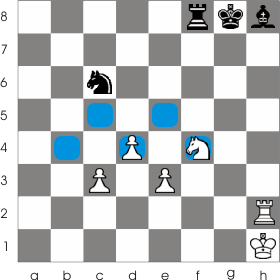 You can see that Black can't move his pieces on the blue square nor he can capture the knight at f4 with the rook. If he does either of those things he looses a piece over a pawn which could lead to his defeat.